So this little project has dragged on a little longer than originally anticipated. 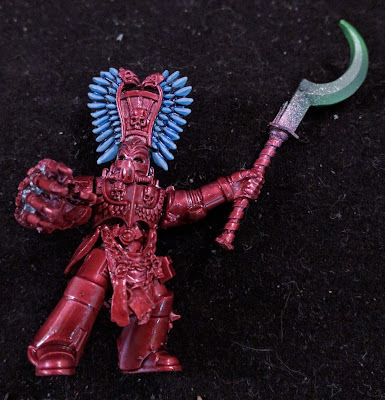 After painting this Sergeant I didn't like the helmet detailing, so I stripped it back and started it again. Here it the progress, so far, second time round. Still a LONG way to go on this one, but I am more happy with helmet the progress, thus far. 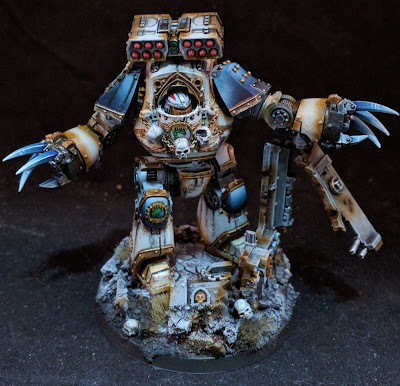 XII Legion World Eaters Leviathan Siege Dreadnought - Complete. 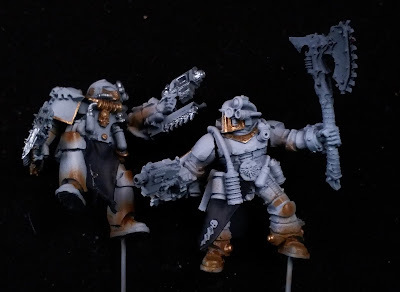 So after the original paint job, then the paint strip effort, this is the progress on these two Apothecaries. Plenty more work to do on them. More to come. 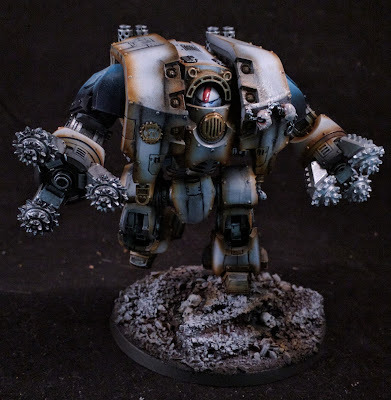 XII Legion World Eaters Contemptor Dreadnought - Complete. Glad to finally finish this one off. Turned out alright, hey ? 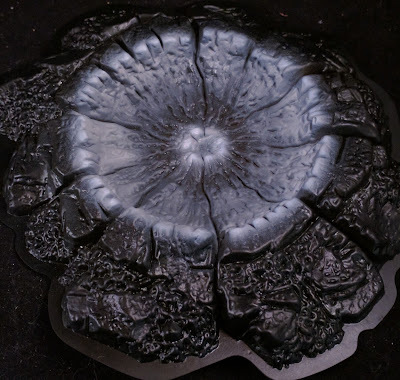 When I dug out those resin Generator pieces, I stumbled upon some old Pegasus Hobbies Craters. So I thought I would give one a whirl and paint it up whilst the airbrush was out. Here is the progress, thus far, with just primer, base layers and a few blends to bring the grey crater to life. What do you think I should do for the outside of the crater? 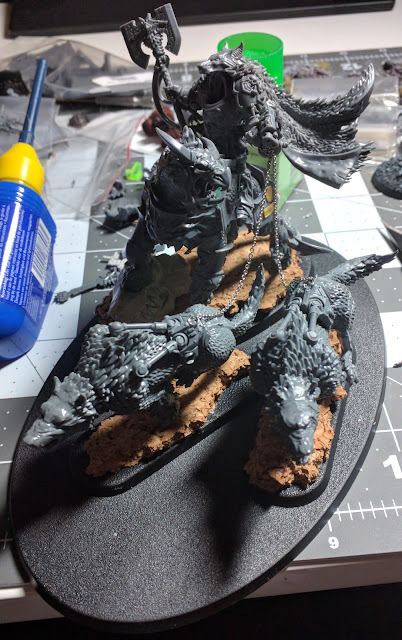 With rumors of Logan Grimnar's demise proving to be premature, I felt I should dust off this old kit bash I was working on about a year ago. i will use the correct base size, when I finalize the positioning. But until then, I should get some paint on these bad boys. 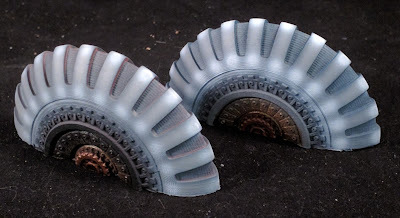 I was digging about my bits box and found a pair of these shield generator, power coil resin bits. They're made by Secret Weapon Miniatures. Here is the progress, so far. So these pieces come from their Masterclass Terrain series. Two Generators in this set, and another set you can buy comes with a control console, that clips into the main generator piece. I am still trying to work out what colour I want the power coils to be, maybe green or a red. And I might have to investigate how object sourced lighting (OSL) works. I started working on a pair of Apothecaries. The idea is that they will split up and hang with the two squads Red Butcher's squad in their Spartans. 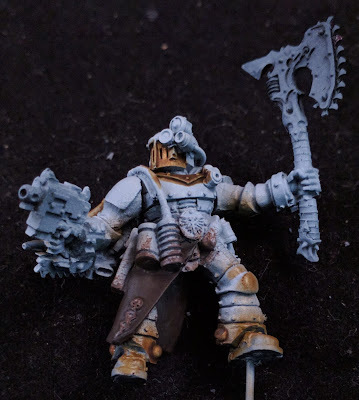 I found a great article in Angel Giraldez's latest Masterclass on painting cracked leather, similar to the recent White Dwarf article, but a little more manageable with a stipple brush. Follow the progress on this one, should be good. Some progress on the Leviathan, this weekend. Started working on the arms. The head is not yet finalized, so I haven't attached the carapace. You can probably see that the Siege Drills still need to be finished and further weathering completed. Some grass tufts need to be added to the base too. 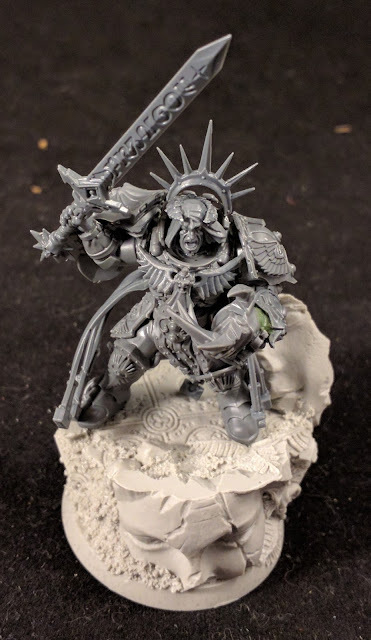 The Burning of Prospero box also released some of the most awaited miniatures, with the Adeptus Custodes. Here is how my efforts have progressed, so far. I opted for Guardian Spears on my Custodes and I am still very far from finishing. Now to get this gold, I followed a similar recipe to what I previously used for the Sisters of Silence.